What do all the NAFTA talks mean for Vancouver Real Estate? If you are like most Canadians, you are concerned about NAFTA and its effect on our economy. In my world, as a mortgage broker, I am deeply concerned about what this may bring for our real estate market, but there is one good thing about it (you’ll just have to read all the way to the end to find out…)! It’s definitely early days, and making predictions is nearly impossible, however, with a little bit of research, you can easily learn that what’s happening right now in terms of Trade is NOT GOOD! We’ve all heard of NAFTA, but do we really know what it’s all about? NAFTA is the ‘North American Free Trade Agreement’, between Canada, the United States and Mexico. It’s been the largest agreement of its kind since its inception! The three partnering countries agreed to remove trade barriers and eliminate tariffs so that NAFTA could increase trade AND investment opportunities. The agreement has been in place since 1994 and only recently has been in great jeopardy. Of the 7 main goals behind NAFTA, perhaps the one that stands out the most is increasing investment opportunities. As part of President Trump’s 2016 election campaign, he promised to re-negotiate NAFTA in order to get ‘a better deal’ for US workers. He had stated that if Canada and Mexico didn’t agree to the terms he wanted to re-negotiate, that he would pull out of the agreement. Most recently, at the G-7 summit held in Canada, there were some interesting exchanges between President Trump and Prime Minister Trudeau. Trump’s bully tactics are not working as experts think he intended, and Trudeau is standing quite strong for Canada. It is clear that Trudeau isn’t backing down to the threats of tariffs being placed, yet it seems we are bracing ourselves for a trade war. So… what would happen to Canada if we did get embroiled in an all out trade war? Would prices of our goods go up even more? Would our real estate market suffer? According to one study in the Financial Post, Canada would stand to lose 85,000 jobs in just one year if NAFTA dies. Other predictions say “…real merchandise exports would fall by $8.9 billion or 1.8 per cent in the year following a NAFTA collapse, with the largest impact on motor vehicle and parts exports which would plunge by about $6 billion.” Yikes! But let’s move on to why I’m really interested in this subject. For me, it’s all about learning how NAFTA actually impacts the Canadian Real Estate Market. Commercial real estate stands to potentially lose the most as a result of a crumbling NAFTA agreement. It will disrupt industrial and logistics markets, shipping prices will take a hit, and construction jobs will be at risk. The loonie took a plunge immediately after the initial trade war threats by Trump, and investors (real estate especially) are now much more cautious. It is my belief that the NAFTA uncertainty is negatively impacting the already shaky metro-vancouver real estate market, and this is on top of the relatively new mortgage rules (stress test). It’s quite the volatile time in real estate! There is one shining beacon of positivity in this whole thing, and that’s the NAFTA talks’ effects on mortgage rates! When the economy falls into uncertain times, the Bank of Canada (BOC) becomes hesitant to raise rates. For consumers who are mortgaged to the max, this means breathing a little easier. Even with the new rules making it harder for first-time buyers to get in to the market, the economic uncertainty isn’t exactly making home prices fall drastically as some predicted when the first trade threats were uttered. Housing values should stay right where they are if rates remain the same – and I suppose that’s about as good as it gets in my neck of the woods helping people finance their homes. What do you think? Do you think NAFTA talks will impact the real estate market positively or negatively? I’d love to hear your thoughts! As a mortgage professional, I offer one-stop convenience and impartial advice. 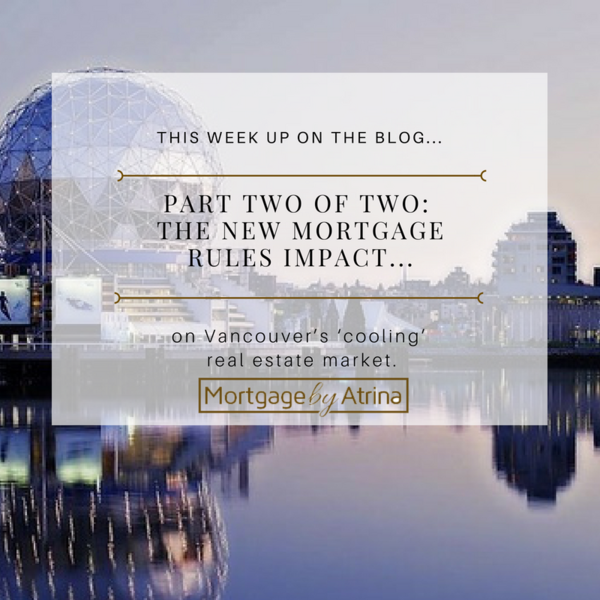 Previous Post 2/2: New mortgage rules impact on Vancouver’s real estate market Next Post Variable vs. Fixed – the debate continues…still not one size fits all. What are the benefits of a Home Line Of Credit (HELOC) and when to use it? It’s a buyers market out there!